The West has never been interested in Belarusian cinema, but things are changing now. For the first time in history Belarus has a few films that international audience can appreciate. Although we cannot consider the existing films as 100% Belarusian, "Above the Sky”, “In the Fog”, “Viva Belarus” have become breakthroughs for Belarus. All three films represent Belarus from different angles. "Viva Belarus" shows the fate of young people, who, despite their own desires, are forced to get involved in politics. They learn the downsides of the Belarusian system and alter their predestination. "Above the Sky” also depicts a story about young people, however the writers target social issues more in this work. The protagonist of the film has to get used to the idea that he has HIV and remains unexpectedly close to his deathbed. “In the Fog” shows the realities of the Second World War and its moral tragedy. Very little Belarusian money went into these projects. Poland’s Ministry of Culture together with the French Canal+ financed “Viva Belarus”, while the UN Program of Development paid for “Above the Sky”. Belarus only allocated a small quota of funding for “In the Fog”. Germany, Russia, the Netherlands and Latvia provided a considerable amount of money to support the film. “Viva Belarus” remains the most controversial film about Belarus that has ever come to light thus far. The crew was working on the film in Poland, while Belarus proper has very little space in the film. The stories of the Belarusian political soldiers – youth activists illegally drafted into the army – became the basis of the plot. One of them, Franak Vyachorka, became a script writer and the prototype for the main character. The premiere of the film took place at last year’s Cannes film festival, while in 2013 the film got second place at a film festival in Prague. Very few Belarusian artists have an opportunity to present their works at Cannes and even fewer are able to win an award at an international film festival. The plot develops around a Belarusian musician, illegally drafted to the army despite numerous health problems. In the army, he endures beatings and betrayals, and becomes disabled at the end of the film. Cult rock-musician Lyavon Volsky composed the music to the film – and indeed the soundtrack can be considered one of the strongest points of the film. The film’s creators advertised it as “based on real life events”, still, the film contains many speculations. For example, police never disperse concerts in clubs using tear gas shells in Belarus. An influential opposition newspaper Nasha Niva accused the authors of making a picture of North Korea rather than of Belarus. Such problems occurred due to the weak and limited influence of Belarusians throughout the process of shooting the film. Polish director Krzysztof Łukaszewicz showed Belarus through the eyes of the West, not of Belarus: everything seems worse than it actually is with a huge Lenin monument on the screen to make it look even more horrible. Despite its hyberbolisation, the film has become a noticeable event in Belarus, and Lukashenka’s regime reacted sharply to it. The Belarusian Ambassador to Poland called the film an attempt to make Belarus and Poland enemies. The film creators could not put the UN-sponsored film “Above the Sky” officially on screen for a long time. According to scriptwriter Andrei Kureichyk, the UN Development Programme tried to impose political censorship on the film, so the authors published their finished version on the Internet a year ago. “Above the Sky” got more than 100,000 views on Youtube in a short period of time. Then the video hosting service deleted the film at the request of the copyright holders – the UNDP. The film tells a story of a young musician who has the HIV. The character should rethink his life and realise he was to die in the near future. The plot at first appearance is rather classic for such type of films. However, “Above the Sky” does not only tell the story of living with HIV, but also goes to great lengths in portraying the Belarusian reality: from the negative sentiments of youth to the dullness of everyday life. It was precisely this that made it problematic for the film to be aired on Belarusian TV. The film contain some scenes that even more horrible than those found in the “Viva Belarus”. However, the filmmakers made it less politically biased, and the Belarusian audience accepted it more willingly. The film is not without its faults, and while it became the debut film for many of its actors, their acting could have been much better. Dzmitry Papko, the leading actor in "Viva Belarus", also made his debut in "Above the Sky" . “In the Fog” has one great advantage over the other films. Syarhei Laznitsa, the script writer and director, based the film on the novel by Belarusian writer Vasil Bykau. Bykau remains the main icon of the Belarusian literature. Foreign publishers have translated his works into more than 50 languages. The story begins in 1942, when German troops arrest an ordinary Belarusian and then release him unexpectedly. The partizans suspect the main character of treason and take him to the forest to shoot him dead. However, an ambush waits for them there. One of the partisans die, and the main character must explain to the other that he was not guilty. The International Federation of Film Critics awarded a special prize to the film at the Cannes festival in 2012. The critics accepted the film warmly, despite its moral seriousness. As it is not an easy film, it takes time and a conscientious moral effort to really understand and appreciate the film. The film depicts the war not as a struggle between people, but rather as a moral struggle within people. Belarus has suffered from the absence of domestic contemporary filmmaking for a long time. “Viva Belarus”, “Above the Sky” and “In the Fog” remain rare exceptions to this, films that coincidentally all came out at around the same time. Low salaries in the film production sphere force actors and directors to emigrate and build up their careers abroad. “Above the Sky” script writer Andrei Kureichyk earns money on writing scripts for the Russian comedies, while “In the Fog” director Syarhei Laznitsa has lived in Germany for more than 10 years by now. It may sound ridiculous, but Belarusian operators earn more filming weddings, than in films. The authoritarian character of the country has never facilitated the development of cinema. Creative personalities cannot work in the conditions when they have to coordinate almost every scene with the authorities. Until Belarus has money and the proper conditions for the development of the film industry, the perspectives for Belarusian cinema will be lost in the fog. Some of the festivals in the West continue to show these films. One of them – “Viva Belarus” – you can also view on YouTube with English subtitles. Washington lifted their sanctions on a Belarusian company. What does it mean for the future of Belarus-EU relations? Further integration in the post-Soviet space and Minsk's role in the process, living standards of Belarusians are among the most discussed in the independent and state Belarusian press. Will Brussels relaunch a dialogue with Minsk? Business-oriented “Belarusy i Rynok” weekly comments upon the report of the Lithuanian expert, Justis Paleckis. It reports some of his recommendations for the European Parliament, including preparation of the roadmap for Belarus with certain requirements for the political and economic modernisation. The Palackis’ report has already roused some controversy among other European experts. For example, the Finnish expert, Anais Marin, did not agree with Palackis’ argument on an improvement in the human rights situation in Belarus in 2012. In her words, ‘the situation with human rights in Belarus remains stable-negative, and there are no grounds for its improvement’. American love instead of anger? Daily “Narodnaja Volia” commenting on the recent lifting of sanctions on the company ‘Belttekheksport’ by the Americans, asks if the European Union will act in kind as well. The newspaper cites Alexander Klaskouski, who thninks that the inefficiency of the sanctions could be one of the causes of Washington’s decision. The Belarusian companies clearly managed to avoid the sanctions, for example by functioning under different ownership. The commentator notes, however, that the lifting of the sanctions does not mean that the US has softened its attitude toward Minsk. According to Klaskouski ‘Brussels would like to change its attitude toward Minsk, but only if the authorities will meet minimum expectations for that matter release of the political prisoners’. The commentator noted that the EU is interested in withdrawing a high-ranking politician from the ‘black list’. Uladzimir Makei, Foreign Minister, could be such a needed ‘messenger who could freely travel across Europe and establish contacts’. Increase in average wages: more bottles of vodka. Daily “Komsomolskaya Pravda” informs that the wages in Belarus since 2000 increased by up to six times. The newspaper, however, decided to check what this has meant for ordinary Belarusians. In terms of housing it shows that nothing has improved, because ‘now, as in 2000, Belarusian needs to work for three months for one square km of the house’. It may seem as a rather positive message, because in 2007 Belarusians needed to work for a year and a half to purchase one km square of the house. The second indicator of living standards, the price for a bottle of vodka, proves that life became better for ordinary Belarusians. Since the average Belarusian earned more in April, he could afford 113 bottles of the alcohol. In comparison, in 2000, an average wage allowed to purchase only 41 bottles, almost three times less than today. As the newspaper notes, the more expensive vodka, the more difficult life will become. Cheaper oil and gas from Russia? "Nasha Niva" reports that in Lukashenka’s words, by 2015 Belarus should pay for oil and gas according to priced for Russian domestic consumers. The newspaper notes that decrease in the prices 'would lead to the significant increase of the pace of the Belarusian economy and the average income'. It also adds that 'it would also strenghten the already exceptional dependence of Belarus upon Russia'. People's referendum – the new initiative of the opposition. "Belorusy i Rynok" reports on the initiative that three political organisations want to undertake next year under the name of ‘National Referendum’. Initiators of the campaign are ‘Tell the Truth’, Belarusian Popular Front and the movement ‘For Freedom’. Valerii Karbalevich commenting for the newspaper underscored that the ‘referendum by the opposition's initiative is impossible to carry out. But it is possible to have a political campaign called ‘National referendum’’. He adds that providing that the campaign will interest large groups of society, then it might bring some political benefits for the opposition. Official press optimistic about post-Soviet integration. The government run "Sovetskaya Belarus" states that May turned to be ‘energetic’ due to the recent development in the post-Soviet integration. 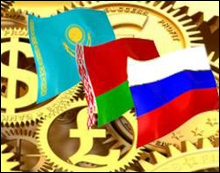 The newspaper comments that Minsk became the platform for further discussions about the CIS, Customs Union, but also about their evolution into the Eurasian Economic Union. The newspaper noted that ‘the three: Belarus-Russia-Kazakhstan clearly are increasingly gathering centralisation energy’. In the words of Alexander Lukashenka: ‘We agreed that the Union will be economic and these political problems that subsequently will interfere the Union’s development, will be gradually resolved’. Lukashenka also added that ‘One cannot limit ourselves only to economic co-operation, because it also requires actions in the sphere of politics, diplomacy, defence’. According to "Sovetskaya Belorusiya", other CIS countries watch closely the process that develop between the Union of Russia, Belarus and Kazakhstan. Importance of Ukraine for the Customs Union. State daily “Zviazda” comments that the recent Customs Union summit did not meet all the expectations and the leaders decided to postpone a number of issues. According to newspaper, the invitation of the Kyrgyzstan and Ukraine ‘was intriguing’. In particular, participation of Ukraine in the integration processes seems crucial. The country has not yet joined the union, but became the observer. Zviazda underlines that ‘In Russia they perfectly understand that the Eurasian integration without Ukraine cannot be complete and so this is important for the Union not to let Ukraine remain aside’. The newspaper notes also on the close co-operation between Belarus and Kazakhstan ‘despite the thousands of kilometres separating the countries’. According to the newspaper, Astana due to reserve from extensive export of its natural resources, might be interested in investing into modernisation of the Belarusian companies. That may lead to deepening the mutual economic co-operation within the very Customs Union but also will enable to launch new projects on a wider scale.